A little kindness goes a long way. With these easy tips, you and your family can show love and brighten someone’s Valentine’s Day. It’s time to get cooking! Invite your kids to the kitchen to help decorate heart-shaped cookies. Then head out to hand deliver them to elderly or those in your nearby nursing home. Surprise the family behind you by paying for their order. Pull slightly forward or park nearby so the kids can watch the expressions on the faces of the recipients as they hear the good news. Get out the construction paper, scissors, glitter, and glue - or print templates of coloring pages. Then have your kids address the cards and go with you to drop them off at the Post Office. Next time the family dines out, take the time to show your kids how to figure out a tip on your phone calculator. Then tell them you’re going to tip even bigger to show love. Let them be part of placing the tip on the table with a Valentine’s card they’ve made. Call or text a friend who has been busy or stressed and tell them you’d like to make dinner for their family. On the appointed day, have your kids help prepare the menu items and select the dessert. If they are able, have them help deliver the meal. Ask your children questions about what they like about their teacher, their favorite subjects, their best day in class, or most fun field trip. Then write a note telling your child’s teacher about the impact they are making. Be sure to include a small gift card for their favorite eatery. Show love to those who work around the clock to protect your family. Have your children draw pictures or pick baked goods and snacks to take to your local heroes. Be sure to deliver them with smiles and kid-sized hugs. Leave positive feedback for your favorite local small businesses. Rate them on Google, Yelp, or their Facebook page. A good review goes a long way and can brighten a busy business owner’s day. Do you know your officemate’s go-to drink? Leave a little early for work so you can grab their favorite coffee on the way. Or pack double the leftovers when you’re bringing your brown bag-lunch so you have plenty to share. Clean out your toy, movie, and game stash by having your kids pick items to give to those in need. Be sure to call ahead in case your local shelter or homeless ministry is in need of specific items. Has your husband or wife been mentioning something they’d like to get or putting off a purchase? Surprise them by leaving a gift in the front seat of their car or on their desk at work. Get the kids involved by letting them pick something else to include. 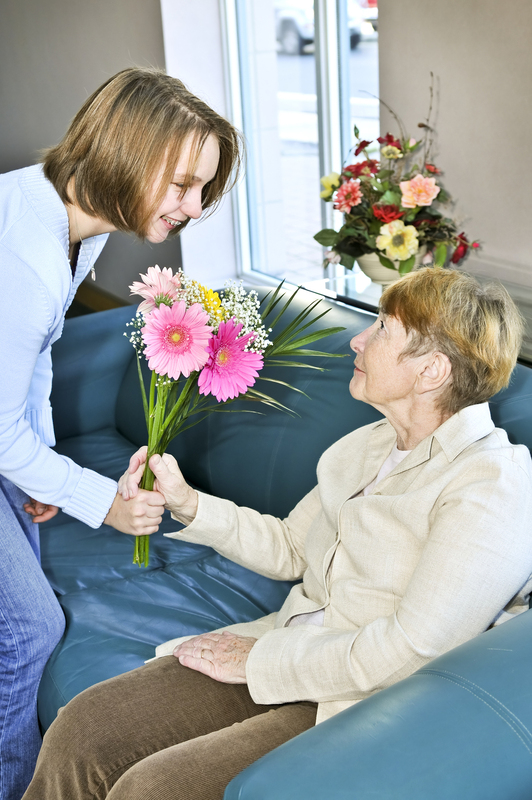 Visit your local florist and choose nearby elderly neighbors or ask your local church about homebound members that may need a visit. Take flowers and sit with them a while. Lead by example and take the time to compliment your grocery store clerk or a fellow parent you meet at the local park. Then challenge your child to compliment someone. Get your young artist involved on a secret mission to leave positive messages on a sidewalk where they will be seen. Write phrases like “You are amazing,” “You can do it,” “You are beautiful” or other positive thoughts. Take it a set further and write similar messages on sticky notes and leave them throughout a store or in a public restroom.